What is MXF? According to Wikipedia introduction, MXF is a “container” or “wrapper” format which supports a number of different streams of coded “essence”, encoded with any of a variety of codecs, together with a metadata wrapper which describes the material contained within the MXF file. Apple Final Cut Pro doesn’t support MXF import. If you want to edit MXF in Final Cut Pro, you have to transcode MXF to Apple ProRes. We recommend you convert MXF to Apple ProRes 422 or convert MXF to Apple ProRes 4444. ProRes 422 and ProRes 4444 are the best encoding format for Final Cut Pro.You can free download Apple ProRes Converter here. Canon XF Series camcorder’s video format is MXF. For importing MXF vido to FCP, below guide will be helpful. How to edit Canon XF Series videos in Final Cut Pro? How to edit Canon XF305, Canon XF300, Canon XF100 video in Final Cut Pro? 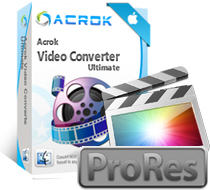 Step 1: Free download and free trial Apple ProRes Converter. Step 2: Run MXF to Final Cut Pro converter, add MXF files in to Final Cut Pro converter. Click “Format” column to choose “Final Cut Pro> Apple ProRes 422 (*.MOV)”. Click the “Settings” button and customize proper video/ audio parameters if necessary. Click the lower right corner “Convert” button to start MXF to Apple ProRes 422 conversion. After conversion, you can load MXF files into Final Cut Pro.